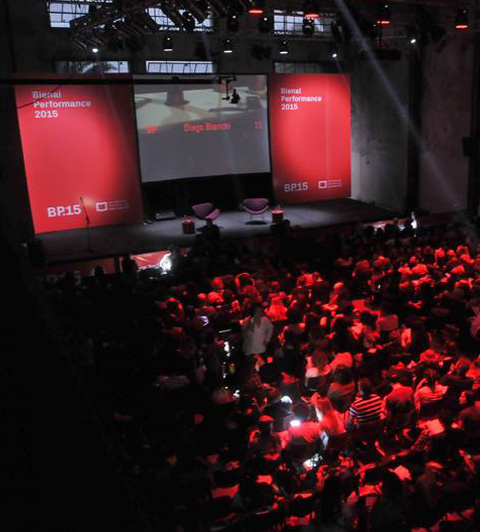 BP.15 is the First Argentine Performance Biennale. The main purpose for the creation of this event is to take account of a long track record of this artistic as well as political expression in Argentina, which has enjoyed international scope and recognition, reaching its peak of popularity in the 60s and 70s, and still thriving. Renowned artists of performance history, and representatives from other related disciplines —such as theater, dance, and music— shall present works especially developed for the Bienal. Since this is what it is all about, pushing the very boundaries of the genre. To approach a definition is impossible per se. It involves such a wide variety of acts that are difficult to point out. Sometimes it gets associated with a theatrical performance, or happening. And it is in that very imprecision —as a slippery, elusive manifestation— where all its overwhelming power lies. The attempt to describe it or explain it will erase it and redefine it, to later mutate into something else. It is the expression of the intangible. But whatever the chosen angle to tackle the term, it is easy to reach the same conclusion: performance is a series of practices with a focus on the use of the body. Since performances acquire different meanings depending on the venue and the context where they take place, they become legitimate paths for the transmission of social identity and the memory of a city. In Latin America in general, and in Argentina in particular, many demonstrations aimed at resisting oppressive political structures, and opposing existing forms of power were interpreted as performances, regardless of any possible artistic origin. At the same time, numerous works of performance art were considered political acts par excellence, due to its ideological stance and the degree of challenge to the established system. We could assert, then, that certain actions or situations, sometimes called performances, go strictly beyond the so-called field of art. the absence of a center, thus turning them into dynamizing spaces of meaning. Its program, which spans from live presentations to seminars, workshops and meetings in multiple venues, aims at generating simultaneous environments for the exploration, exhibition and questioning of ideas, with the intention of narrowing the existing gap between the performance praxis and the theoretical discourse. It will tackle as diverse subjects as the transformation of every-day life events into different art forms, the integration of new technologies into performance as transgenre (its articulation with theater, dance, installations, music, etc. ), and the value of documentation and the recording of pieces as transitory experiences. A performance never passes unnoticed: it generates acceptance, or rejection; reflection, or denial, forever travelling through the thresholds of ambiguity and contradiction, trying to dynamite decades of binary opposition between the live and the mediated experience, the spontaneous and the staged, the authentic and the planned. However, currently there are other themes that interfere with its elucidation. At such a time as this, when life is so mediated by scientific and technological advances, could the presence of an artist be such a powerful and destabilizing fact? Can a performance be represented by a different body other than that of the artist who conceived it?